Charlie Hoeveler and I have been friends for nearly 25 years. Our mutual respect for one another continues to grow. There is nothing better than playing doubles with someone that you love to spend time with. 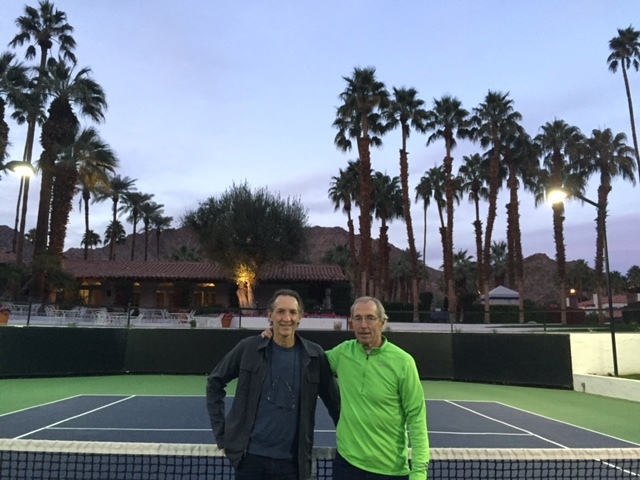 When we play a tournament, we share accommodations, eat all of our meals together and share life, business and, of course, tennis stories endlessly. Our doubles match on Wednesday was particularly special in that we were both on fire throughout. It is more common in doubles that one person seems to carry the load while the other is finding their shots and game. A great team is one where the leadership moves seamlessly back and forth during the match. That there is no ego of who is better. The roles of leader and support move across an invisible space. But the real sweetness is when both partners are playing great at the same time. That was our match yesterday. We both played at the top of our games from beginning to end. Our combined errors could be counted on one hand. And this was in a match where there was an interesting dynamic for me. I was playing against Theo Mandel, who has been my regular doubles partner since moving to Boulder. Theo and I met and became good friends quickly, as the court is a place that creates deep bonds. He brought me into the Boulder tennis community. I never wanted to lose in this match but I also wanted Theo to win. Of course that couldn’t be and between the lines, as the ball is in play, each of us reaches to be our best. So as much of a buddy as he is, while playing he was just a faceless opponent. Unrelated to the doubles but really big for me was that my physical recovery from Tuesdays match was off the charts. I woke up and, even though I was a little stiff, by match time I felt like I hadn’t even played the day before. As a matter of fact, I felt like a 20 year old when playing. In part, I know, this is due to living at a higher altitude. But moreso I believe it is a result of playing without tension. When I started to compete 30 years ago I was sore after every match, win or lose. Walking down the steps the following day was always brutal. I am sure that keeping results in the right place and playing for the joy of competition is a the gift that my body appreciates each day. Smiling in the heat of competition keeps my muscles happy. Semis of the dubs today. PS Apologies to my Tuesday singles opponent Chris Armstrong for calling him Carl throughout my journal entry about his win over me. Even though we have only played together once and Charlie and I have partnered many times that’s the feeling I have playing with you both. Good luck in the desert. Congratulations to you and your partner/friend on the great match. Love the photo. Keep feeling 20! Bob , I’m enjoying your posts . Keep them coming . Best of luck ! What a wonderful day on the court! Still looking for that partnership! Thanks for sharing!